Biography of American History Painter & Portraitist. National Gallery of Art, Ottowa. One of the most influential figures in American Colonial art (c.1670-1800), and the first American artist to achieve international fame, Benjamin West began as a portraitist but made his mark in the genre of history painting. 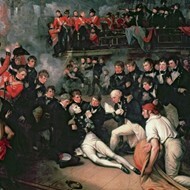 After several unconvincing neoclassical compositions, West painted his masterpiece The Death of General Wolfe (1770, National Gallery of Art, Ottowa). It was one of the first history paintings to feature modern dress, and the first such work to become an overwhelming success. Its popularity helped to revolutionize the artistic conventions of the day, and West's approach was widely imitated. West spent almost his whole career in London. A co-founder, later President, of the London Royal Academy of Art, West became the official painter to King George III, and one of the best history painters of his day. In addition, he influenced a number of contemporaries, including the history painter John Singleton Copley (1738-1815), the portraitist Gilbert Stuart (1755-1828), the landscape artist John Constable (1776-1837), the romantic Allston Washington (1779-1843), and the painter-turned-inventor Samuel FB Morse (1791-1872). See also: American Art (1750-present). West was born in Springfield, Pennsylvania, the tenth child of a country innkeeper. Mostly self-taught as an artist, he began painting (mostly portraits) as a young teenager and in 1756 came to the attention of William Smith, provost of the College of Philadelphia, who became his patron and provided both education and social connections. Around this time West was befriended and influenced by the English expatriate painter John Wollaston, and began painting portraits in New York. In 1760, sponsored by a group of affluent Philadelphians, West travelled to Italy for three years (1760-3) where he copied the works of Italian Renaissance Old Masters such as Raphael and Titian, and studied under one of the leading neoclassical artists - the German court painter Anton Raphael Mengs (1728-79). He also met another exponent of neoclassical painting - Gavin Hamilton (1723-98), the British history painter. All this stimulated West to take up history painting. In 1763, he moved to London, where he remained for the rest of his life. Initially he continued with his portrait art, but in 1767 received his first commission for a history painting - Agrippina Landing at Brundisium with the Ashes of Germanicus (1768, Yale University Art Gallery). This confirmed West as one of the most talented narrative painters in London, and brought him to the attention of King George III. 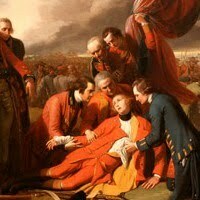 However, it was with The Death of General Wolfe (1770, National Gallery of Art, Ottowa) that West sealed his reputation. The work was not - as is sometimes alleged - the first history picture to feature modern dress. This honour, seemingly, belongs to Edward Penny (1714-91) for his Death of Wolfe (1764). However, West's painting rapidly became both a critical and popular success throughout Britain - it was shown at the Royal Academy (co-founded in 1768 by Joshua Reynolds and West) in 1771, and was so well received that West was obliged to paint copies. It was the success of the painting that caused it to become so influential in releasing artists from the obligation to cast their historical characters in classical costume. There were sceptics of course, and for a time they included both the King and Joshua Reynolds, but the work's popularity swept all concerns aside and it became one of the most frequently reprinted images of the period, selling thousands of engravings. Another popular work by West was William Penn's Treaty with the Indians (1772). In 1772, West was appointed historical painter to the court of King George III, at an annual fee of £1,000. However, between 1773 and 1801, West painted no history pictures at all (!). Instead he spent most of his time painting portraits of the royal family - for example, see Portrait of George, Prince of Wales, and Prince Frederick, Duke of York (1778, Hermitage Museum, St Petersburg) - and from about 1778, he began work on a series of pictures for stained-glass windows and church altarpieces throughout England. In the process, his studio became so busy that he employed six full-time assistants to cope with the large-size religious commissions he was receiving. In 1792, he succeeded Sir Joshua Reynolds as President of the London Royal Academy, but resigned in 1805 after internal disagreements. However he resumed the post in 1806 and held it until he died. Towards the end of his life, although still devoted to oil painting in a neoclassical vein - see his Benjamin Franklin Drawing Electricity From the Sky (1816, Philadelphia Museum of Art) - West took up Romanticism. He had previously dabbled with this idiom, in dramatic works like Saul and the Witch of Endor (1777, Wadsworth Atheneum, Hartford), but his later paintings such as Death on a Pale Horse (1817, Philadelphia Museum of Art) have been acclaimed as forerunners of Delaxcroix (1798-1863). Since his death, West's reputation as a painter (never the greatest, despite the modernity of his ideas) has declined. But his importance in the history of art is based on two more important issues. First, he redefined history painting; second, he inspired successive generations of American artists, a large number of whom benefited from his presence in London and from his help and advice. He is rightly described as the "Father of American Painting." Paintings by Benjamin West can be seen in many of the best art museums throughout the world.  For more information about 18th century painting, see: Homepage.